We invite you to come to any of our services and events to celebrate Easter. The church family will meet at a number of different small group venues to share communion during Holy Week. If you would like to go along to one of these, but you're not in a small group, please contact the church office on 0116 286 3145. 2.50pm-3.20pm in the worship space at the new church site on Dog & Gun Lane, Whetstone. Please note: you will be entering a building site, so all participants must follow safety instructions at all times. There is no parking on site or on the Whittle estate car park. Please park in the village car park or on the industrial estates along Cambridge Road where there are no restrictions. 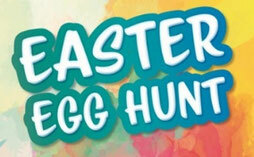 Join us on the church lawn and for an egg hunt around the village. There's a bouncy castle, crafts, biscuit painting, face painting. Children under 12 to be accompanied by an adult. 10.45am service includes Kid's Church. Parking near the church will be difficult. There is a drop-off point outside the church for those with reduced mobility. The nearest car park is the free village Car Park on High Street.